The risk of getting mesothelioma cancer increased 3 percent for each year working in the taconite mining industry within the Iron Range region of Minnesota, according to an extensive, five-year $5 million study. Taconite is a hard-banded, low grade ore used mostly in the iron and steel industries and has been mined extensively in the Northeast portion of the state. More than 80 taconite miners died in recent decades from mesothelioma, a rate that was three times the rate of the general population in the state, according to earlier findings. Researchers from the University of Minnesota conducted the Taconite Workers Health Study following public outcry in 2007 over the suppression of earlier state health department findings about mesothelioma deaths. Taconite miners for decades expressed concerns about the large amount of dust produced by the mines. Taconite often contains traces of asbestos, the only recognized cause of mesothelioma. Asbestos fibers are categorized as “elongated mineral particles.” But the type of elongated mineral particles produced by iron mining and taconite dust previously were not linked to mesothelioma. Commercial asbestos products once played a key role in the taconite industry for various purposes, including insulation, and it remains a prime suspect in the mesothelioma deaths. Researchers in this study did not differentiate between commercial asbestos and the taconite dust fibers when they addressed the elevated cases of mesothelioma. Researchers also did not say definitively that the dust from taconite operations causes mesothelioma, but only that the industry did. It can take anywhere from 10 to 50 years from a first exposure to asbestos before symptoms of mesothelioma become obvious. Asbestos exposure also can cause asbestosis, lung cancer and other respiratory illnesses, many of which were part of the taconite industry study. 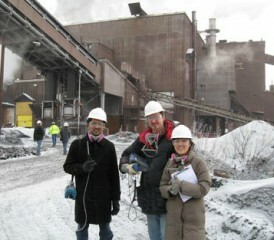 The researchers did say that current occupational exposure to taconite mining dust is within the safe limits. Researchers looked extensively at the cumulative exposure to the industry and determined that the risk factor rose by 3 percent for each year someone worked with taconite in the Iron Range. The causes of death in taconite workers, when compared to the general population in the state, were higher than expected for lung cancer, heart disease and mesothelioma. The researchers also determined that the air quality in areas surrounding the mines and processing plants is acceptable. It found the quality was actually better than in most other parts of Minnesota in regard to particulates in the air. It also said that spouses of workers and others in the communities do not face an increased risk. Researchers presented their results Friday in a community meeting with an estimated 100 people attending in Mountain Iron, Minn. They repeatedly emphasized that the dust was a possible link, but not a certain one. Additional findings from the study are expected to be presented at another town meeting in coming weeks. And a published report of the findings should be available within days.